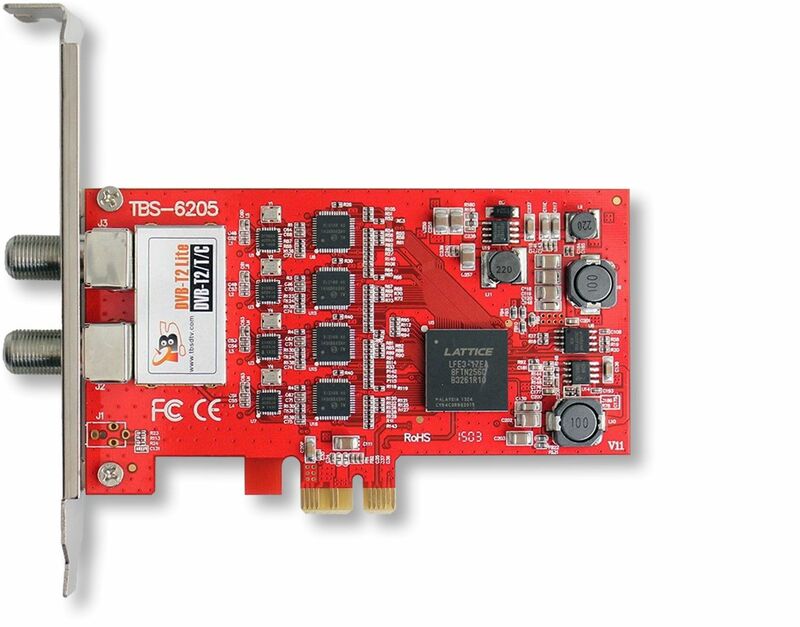 These PCI Express TV tuner cards from TBS Technologies offer great picture quality and allow you to watch/record up to two or four terrestrial or satellite TV channels simultaneously. 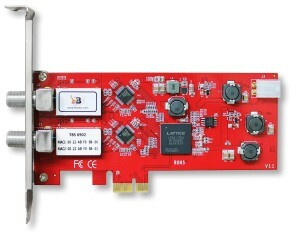 We are pleased to offer the TV tuner cards which Media Center fans have been longing for. 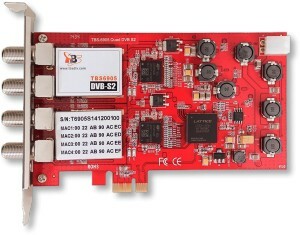 These latest PCI Express cards from South-Korean DVB experts TBS Technologies offer the ability to receive standard and high definition TV channels and come in a choice of terrestrial or satellite models, along with quad or dual tuners on one card (see notes below for recommended software). 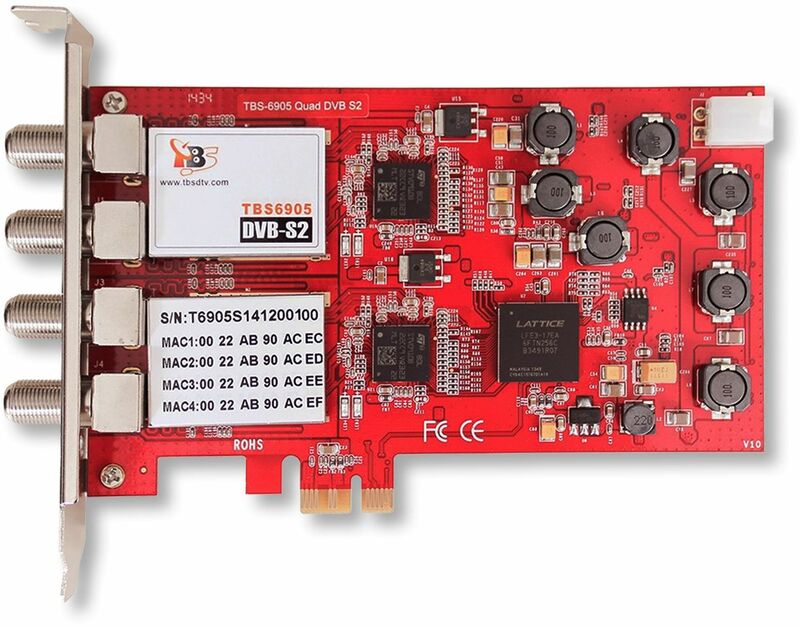 Despite their capabilities, the cards are physically quite small and all cards except the quad-tuner DVB-S2 version can be fitted with a low-profile or standard-height PCI backplate (both are supplied), so they will fit into a low-profile or full size case. And if the ability to record up to four TV channels simultaneously isn't enough, you can even install multiple cards - this scenario is fully supported by the WHQL 32-bit and 64-bit Windows drivers. Please note that for the satellite (DVB-S2) models, it is advisable to connect a power cable to the card in order to ensure that it will receive enough power, because some motherboards cannot supply a high enough current through their PCI Express slots. The TBS 6904 card comes with an adapter which can be connected to a standard spare Molex 4-pin power connector. 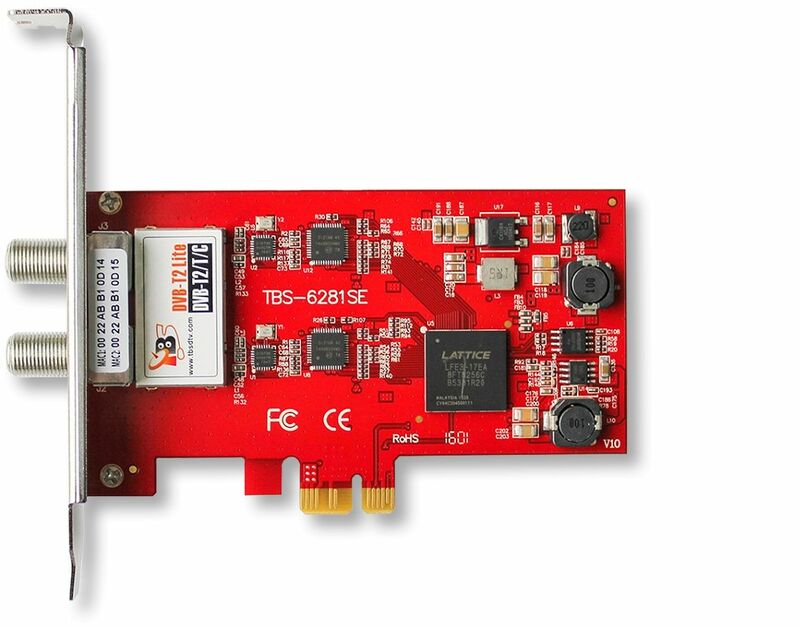 The TBS terrestrial cards are compatible with Freeview (DVB-T) and Freeview HD (DVB-T2) broadcasts, although 100% compatibility with Freeview HD can't be claimed. The reason for this is because technically, the Freeview HD system is a hybrid service which uses a combination of both a terrestrial TV signal and Internet streaming. For example, Motors TV is actually streamed by Freeview HD set-top boxes through the Internet, not from a TV broadcast signal! Hence the TBS DVB-T cards won't work for this kind of channel. However, channels which are fully received through your TV aerial will work perfectly. The TBS Satellite cards are fully compatible with Freesat and Freesat HD broadcasts, in addition of course to many other DVB-S and DVB-S2 satellite broadcasts depending on which satellite the dish and LNB are aligned to. 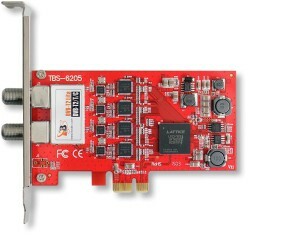 Although TBS supply software with their TV cards, we strongly suggest for the best viewing experience that you use Windows Media Centre which is supplied as standard with all versions of Windows 7 allowing you to watch and record terrestrial and/or satellite TV (in conjunction with a TV tuner card), as well as watching films, viewing photos and listening to music. Windows 8.1 and 10 do not include Media Center, although it can be added to Windows 8.1 Pro only for a nominal charge by requesting a product key on the Microsoft website. Adding Media Center to Windows 8.1 Pro also gives you the ability to play DVD films. We recommend Windows 8.1 Pro for Media Center use rather than Windows 7 because it has more features, faster performance and will be better future-proofed. Please note: The Media Center key mentioned earlier is only compatible with Pro version of Windows 8.1. PLEASE NOTE: As already stated Windows Media Center is not available with Windows 8.1 (non-Pro version) and Windows 10 and never will be! Some customers have reported that the TV tuners on these TBS cards become disabled after the PC resumes from sleep mode. This is due to Windows 7's power saving configuration on the PCI Express bus. In order to prevent the problem occurring, please change the PCI Express Link State Power Management setting to 'off'. It can be found in Control Panel > Power Options > Change Plan Settings > Change advanced power settings > PCI Express > Link State Power Management.